The Purdue Mortar Board Tournament was just what was needed, providing the fans with exciting action, and a chance to see the newly improved IAF gym. It provided the coaches and staff a chance to see the players in a game environment. And it gave the players the thrill of playing in the Boiler Box. Vision. Discipline. Passion. Defense. Synergy. Character. The light gold background with black shading on the edges give the pictures a surreal look. There are three on either side of a large "P" and the new scoreboard. (Those pictured are Danita, Liz, Steph, Kelli, a huddle after a point has been won, and Sammi.) It gave quite a few people goose bumps on first sight. On the North wall, above the student section, are the Big Ten banners, shiny, large, and colorful. Six on each side of a smaller scoreboard, with the Big Ten blue on white as the twelfth banner. On the East wall, banners hanging from the ceiling show Big Ten achievements. Big Ten Championship. 1979. 1980. 1982. 1985. On the West wall, there are five banners from the 80's with NCAA Tournament years and accomplishments. Then three more banners that have 1990, 2004, and 2005. The last one, of course, is "NCAA 2005 Sweet 16". Dave Shondell seems to frequently be quoted in interviews saying that this is going to be a good team, but that they will have succeeded if they improve. He always sounds cautiously optimistic, and the team keeps doing better than expected. Kind of scary-cool. When he arrived, he thought it would take 4-5 years (if I am remembering correctly) to build a tier-one Big Ten team. We had good bones, we just had suffered a lot of injuries and moral was low. He came in with the positive attitude is required, no nonsense, let's get down to business approach, and practically doubled the size of the team. Instead of having a couple players on the bench, there was a long line standing on the sidelines. But when we were hurt by players having ACL injuries, back problems, tendonitis, broken noses, and such, there were healthy players who were ready and willing to play. Having lots of players really helped also with the Tournament. The visiting teams each played 3 matches, but Purdue played all four teams. This allowed the coaching staff to try different lineups, and everyone got to play, except for Katie Bremner, who is going to red-shirt. (She is going to play in the backcourt, and there is already so many good players vying for those positions, that she will get more playing time if she waits a year.) In the final game against Clemson, Brittany played front row, and the freshmen were on the bench. She came in and fired everyone up, and I was amazed. Partially it was because she was blocking their right-side hitter, but Clemson seemed to be setting OH (left-side) against two blockers, not trying to go over a shorter Dilly. And when they did try to hit over her, Brittany was there with the block. That is why she won MVP. After she came in, Purdue won game four against Clemson, and got to hoist the trophy with a 4-0 record. The players were thrilled to have defended their home court, and even went up in the stands in the student section, giving out high-fives and thank yous for the support. The students (including the band) filled the North bleachers, chanting and dancing, making the Boiler Box rock. And they are not sometime fans. They have a chant for each player, when they serve, and when Senior Mel served, she still got: "Hammer! Hammer!" from when the lefty was deadly in the front row her freshman year. After two ACL injuries, it is hoped that Mel can come back and play back row. She came in as a serving specialist, and is counted on for her Senior leadership. Some highlights statistically were Emily coming in for two games against Bradley and getting a match high 11 kills, after being out last year due to injury. 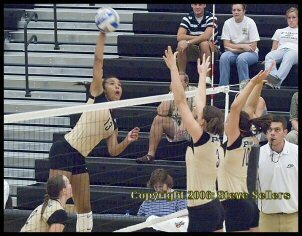 Danita hit from the right side, left side, and out of the back row, getting 132 total attacks, and averaging 4.08 kills per game. Sammi was consistent, getting 99 sets, keeping a high hitting percentage (.533 vs. Bradley.) Stephanie was a monster from the middle with 83 total attacks, and a .373 hitting percentage overall. The number of aces tallied was exciting: 32. Sam leads the team with 10. Sam also had 136 assists in 13 games. Lindsay played in 8 games and had 28 assists. So the jury is still out on whether a 5-1 or a two-setter rotation will be used. Kelli suited up as libero except when she played front row against Albany (with a .692 hitting percentage!). Kelli had 21 digs against Clemson, and 57 total digs for the weekend. Anne had 27 digs and Brittany had 25 in thirteen games. The team averaged 14.23 digs, 17.08 kills, 2.15 blocks, and 2.46 aces per game. Against the 16th-ranked team in the nation, there is no one who is going to be "surprised" anymore. It was nice to see the team fight back from being down in game three against Clemson. It has to be intimidating to come into the Boiler Box if you are an opponent. And it has to be thrilling as a player to come through the train, and onto the court to the cheers of 1700+ people! The renovations to the IAF gym are great. With now almost 2300 seats available it is time to fill the Boiler Box.